Team San Francisco wishes all members of the Federation board and general assembly good fortune at this year’s assembly meeting in Limerick and a successful discussion of the most critical issues facing the future of the Gay Games. 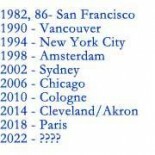 As you are all probably well aware, in April Team San Francisco submitted for your consideration a counter proposal to the one world event working group’s proposal, and we hope it is given serious consideration as the best hope for the future of the Gay Games brand and mission. If you have not seen it, it is available here. Team SF will hold its annual membership and elections in November. At this meeting we expect to update our bylaws and discuss initial plans for organizing our constituents for Gay Games X in Paris in 2018. Because of the recent discussions about what will happen to the Gay Games after 2018 and the uncertainty of what form any event after that will have, particularly with respect to the oversight and conduct of sports events, Team SF will also hold a membership discussion on its involvement in the Federation of Gay Games and an evaluation of our continuation as an FGG member. The possibility that after Paris a “unified” global event would change its focus from sports and cultural inclusion to add in conferences and workshops triggers for Team SF a reevaluation of our FGG involvement and what the “return on investment” is of our membership. The last time Team SF membership underwent a similar discussion was in 2004, when the subject of whether to support the (World) Outgames fit our organizational goals. It was determined at that time that we did not have the bandwidth to support two global events and that we should commit solely to the Gay Games as being the event that was most closely aligned with our commitment to sports inclusivity. We have consistently reiterated and republished that stance in subsequent years and until the current FGG discussions with GLISA have not seen any reason to alter that stance. We are pleased that members of Team SF who have been on the recent teleconferences with the FGG co-presidents reported that those board members who spoke expressed continued support for the Gay Games brand and mission. We are also concerned, however, that at this time, those hopes are merely that — hopes, not certainties. In the assembly correspondence shortly after we presented our Team SF proposal, one board member on the working group stated that city teams in large markets such as San Francisco were “extraneous layer of administration that very few need, or want.” Considering the historic presence in the FGG of such city teams, that was a troubling remark with which we disagreed, yet it was never retracted nor was any apology ever given. If that is indeed the sentiment of the FGG board, than we can understand that the involvement of Team SF is no longer appreciated and we could do well to explore ways to interact with other LGBT inclusive sports event that would be more receptive. This letter is to inform the assembly and the board of our concerns and pending discussions, as we do not want anyone to feel later that they were blindsided. To put things in the simplest terms, if the Gay Games continues as the exclusively participatory sports and cultural festival for all that they have historically been, then we shall be overjoyed and enthusiastic to continue to work with the FGG for 2022 and beyond. On the other hand, if oversight of sports events is weakened by leaving decisions in the hands of the hosts, and resources are devoted to conferences and workshops, Team SF will be forced to examine alternative events and organizations to work with to encourage sports inclusion and diversity as stated in our bylaws. Again, best wishes for a successful and productive meeting in Limerick. We hope that the FGG and Team SF can continue to work together on their missions of sports participation.